The echo of twelve gongs of the clock reverberated throughout the tower and faded. At the top of the stairs on the third floor landing crouched Ishcandar, Lido, and the two Jeremies peering through the slit in the door that Ishcandar had ever so carefully and quietly cracked open using the skeleton key he has pilfered from Yakov. Behind them, at the bottom of the stairs holding the second floor door closed was Hermel. Next to him stood Johan holding a torch. The air was chilly, and there they all had a strange feeling about the tower though none of them could put their finger on exactly what it was. In the large open chamber a tall lanky man wearing a white lab coat and gloves with long black hair flowing over his shoulders and a pot-marked face was passing beneath the glowing green crystals of an ornate chandelier hanging from the ceiling. He was walking toward an enormous wooden table on which were stacks of books, papers and peculiar looking equipment consisting of glass tubes, flames, meters, dials and blinking lights, among other things. He held a candle in his left hand while reading the leather bound tome in his right arm. He had not noticed eight sets of eyes peering at him. Lido could barely make out the title of the book, but managed to read along the spine its red letters, “Radio Telemetry”, which though he could read, he could not quite comprehend. Meanwhile Ishcandar was scanning the rest of the room looking for things to steal. His greedy eyes landed on a strange device on a desktop further beyond the table beneath the window that overlooked Dunn’s Brook three stories below. The device was a square wooden box with a metallic circular rod connected to the top. It was about twelve inches across and eight inches high, while the rod on which the metal circle rested was approximately six inches tall, and the metal circle itself had a diameter of twelve inches. There were dials and knobs, meters, switches and lights on a side panel of the box. The circular metal bar appeared to be rotating slowly while red, blue and greens lights were blinking in slow unison. Ishcandar eyed the room from every angle to determine exactly how he might get to the box without Doctor Lobe noticing him. He could, he thought, either try to slip between the table and the wall, or he could try sneaking through the stacks of books and come out on the other side of the room near the desk. Either way appeared to him to be very risky. He needed a diversion; one that in fact never quite came. Meanwhile, downstairs Hermel and Johan were listening at the door to the second level. Nothing stirred. Hermel contemplated hammering the door shut with an iron spike, but it seemed to him that this would make entirely too much noise. He tried the door handle, but found that it had locked behind them after they had entered the stairway. With nothing else to try they waited and listened at the door at the bottom of the stairs. The other party members had already entered the third story chamber and confronted the man, whom they presumed was Doctor Lobe. Ischandar swung the door open, and said “Doctor Lobe, my good man!” and stepped into the room. “Who are you?” said Doctor Lobe looking up from his book with an expression of mild surprise and annoyance. “We are friends in need, Doctor. We have a a young man here whom we believe you know, and who happens to be quite ill,” replied Ishcandar, pulling Jeremy, who was still carrying Jeremeze, forward into the room. “This boy needs your care,” said Lido. “I see,” replied Doctor Lobe, looking over at the young boys squarely. “Hello Jeremy,” he said without emotion. “How did you get in here?” he asked of Ishcandar and Lido. “The boy needed your help, and we came in with him to make sure that he got it,” replied Lido firmly. “I see,” replied the Doctor. “Bring him here to the table then,” said the Doctor clearing a space on the large stone table before them. Jeremy put the boy on the table, and stepped aside as the Doctor came and took his pulse. He gave a brief assuring glance to the young lad laying there looking up at him. The Doctor gave the young fellow a thorough examination, and then announced with a sigh that he was quite damaged, and expressed some regret at this with a sigh. “What caused the damage?” asked Lido. “When was the last time you saw him?” asked Ishcandar, trying not to sound overly inquisitive. Jeremy stared at the Doctor with a whistful look, hoping he would take notice of him, which he did not. “Are you aware that the rest of the world thinks your dead?” asked Lido pointedly. “So you did not do anything to make them believe you are dead,” asked Lido. “I am working on my research, gentlemen… I hardly have interest in the rumors that may spill over from –”, he was saying when Ishcandar coughed quite deliberately and loudly the word “Hagglesmiths!” into his hands as if he'd sneezed. The Doctor raised an eyebrow, but otherwise made no particular motion. While Lido scrutinized the Doctor's reaction carefully, Ishcandar then took a look around the room for anything that might be of interest… anything unusual. His eyes alighted on the small wooden desk on the other side of the room below the window on which was sitting the strange looking square box with the circular metal rod rotating above it. Several of the lights were blinking, now a little faster than before. He considered how he might venture his way to it without attracting attention, but it seemed the Doctor’s hawk-like eyes would not allow for such a move. “I’m afraid I can not help you with that,” said the Doctor sternly. He began to grow impatient. Ishcandar was edging his way next to the table, hoping to evade detection, on his way toward the desk with the strange device. Doctor Lobe gave him a withering glance and Ishcandar tried to look nonchalant as he sidled back to where he was. Lido scanned the bookshelves hoping to read the names of any volumes. From what he could see all of them had scientific or medical titles. It was an impressive library. Lido was contemplating the idea that perhaps Doctor Lobe was not of this era in time, and was hoping to see evidence that might confirm his suspicion. 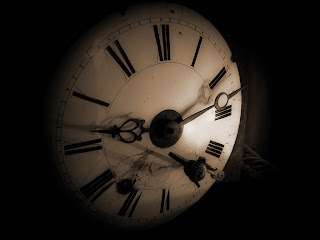 After all, they had noticed that time seemed to be flowing somehow unusually fast, as they all felt somehow that it could not possibly have been midnight by that time. Surely only an hour or perhaps two had passed since they left the Guild Hall at 7pm? But midnight? Impossible, they thought. The additional odd fact was that Jeremy had said earlier that he himself had also met the Doctor for the first and only time at the stroke of midnight on Dunn’s Bridge. However, since he could not place his finger on anything specific, he put thoughts aside for the moment. “If you can take his attention away from me for enough time, perhaps I can sneak behind him and make my way to the desk and carry off that gizmo over there,” whispered Ishcandar to Lido with a quick nod of the head in that direction. “Are you saying we are in danger?” asked Lido. “Are you saying we are in danger from you? Or something else?” pressed Lido trying to obtain as much information as he could. “What is that over there?” Ishcandar suddenly asked Doctor Lobe pointing to the strange device on the desk below the window. “That, my young Hobbit, is a Radio Frequency Triangulator,” replied the doctor as he turned his attention toward the device with considerable relish. “What does it do?” asked Ishcandar. “It triangulates radio frequencies, of course,” replied the doctor impatiently and with some disappointment in his voice. It seemed these lads were not as bright as the Doctor might have hoped. “Could you give us a demonstration?” asked Ishcandar. “I’m afraid there is no time left for that now,” replied the Doctor. “You keep saying that. But you’re here, we’re here… why is there not enough time?” asked Ishcandar. “If you remain you will unfortunately discover the answer to your question,” replied the Doctor with a sigh. “I belong here,” the Doctor replied flatly. “Is this tower going to go somewhere?” asked Lido as he looked around the chamber for any discernable changes. Meanwhile, downstairs Hermel told Johan to stay at the door while ascended to the top of the stairs. Johan took a wide-eyed look and replied that he would much prefer to accompany him and followed behind. When they got to the top they could hear the tail end of the conversation in the chamber outside the door. He was curious as to why the Doctor was suggesting that there was little time and that everyone should leave. “Did the Hagglesmiths ever find out why it is unsafe in the Tower?” asked Lido pointedly. The Doctor gave him a stony look, finally seeming to have come to the end of his patience, and said simply, “I told you, I can not help you with that. And who is that?” asked the Doctor pointing to Hermel who had just stepped through the door. “Hi, I am Hermel. What’s going on?” he replied reaching out his hand to shake Doctor Lobe's hand. The doctor veered away, and so Hermel's hand only brushed his lab coat instead. It was solid enough, he thought, putting to rest the idea that the man might in fact be a ghost. He was not. “The Doctor was about to answer my question as to whether or not the Hagglesmiths found out why the Tower is so dangerous,” said Lido to Hermel. “As I said earlier, my inquisitive Hobbit, I can not help you with that,” replied the Doctor with a stony glare. “I don’t have an exact plan for it at the moment. I am studying the device. It is quite fascinating,” replied the Doctor, again shifting his attention across the room to the device with keen interest. The lights on its front panel were rapidly blinking blue, red and green. “It’s not yours? Where did you get it?” asked Ishcandar. “That is none of your business,” said the Doctor sternly. “How much would it cost for me to buy it?” asked Ishcandar. “I don’t know yet. I am not finished conducting my research,” said the Doctor. “Why are children are missing around here?” asked Hermel. “I can’t say,” replied the Doctor, taken momentarily by surprise. Meanwhile, Ishcandar began to make his way toward the library stacks. “I wouldn’t go there, if I were you,” said the Doctor to Ishcandar as soon as he noticed his movements. “I can’t read a book?” asked Ishcandar innocently. “This is a private Library. The answer is no. You can not,” replied the Doctor. “Doctor Lobe, are you aware that you are dead?” asked Hermel. “I can assure you I’m not dead,” replied the Doctor again losing patience. “Well, so you say. But we have it on good authority that you are dead,” answered Hermel matter of factly. “I can assure you that I’m a better authority on whether or not I’m alive than anyone else,” replied the Doctor dismissively. “Do you know Rothmon?” asked Ishcandar. “I hate to repeat myself again, but you are almost out of time. Please leave now,” said the Doctor pointing to the door. “What time is it?” asked Lido. “Time for you to leave,” answered the Doctor with a grave tone pointing an open hand toward the door. “How much time do we have left?” asked Ishcandar, now glancing around the chamber looking for any changes that would suggest what the tower might have in store for them. “When the time is right, you will know,” replied the Doctor cryptically with a subtle smile. “This doctor is a riddle within a riddle,” said Ishcandar to Lido and Hermel. “I will stay here, and you guys go fetch Mythander and bring him here,” said Hermel suddenly launching a new tactic. “Oh Mythander, certainly. Perfect. He will be able to sort this out,” said Lido, going along with the ruse. There was, of course, no Mythander. Hermel made him up on the spot. “Yes, and he knows quite a lot about Radio Frequencies and Triangulations,” added Ishcandar taking a swig from his brandy bottle, and suddenly feeling quite a bit in better spirits. “It is no concern of mine what you find strange,” replied the Doctor coolly. “It will be your concern when the authorities come knocking on your door. You will have to deal with that,” answered Hermel. For the first time the Doctor seemed nonplussed. He glanced around the room nervously. “But you are responsible,” said Hermel. The slight amusement shown on the face of Doctor Lobe gave them all pause. He seemed to know something that they didn’t know, and his attitude about it was more disturbing to them than anything else. Hermel began to channel his inner life force into a skill he had learned recently at the Guild… Danger Sense. It is a mystical ability that allows him to sense the direction in which dangerous thoughts are manifesting. He felt a vague sense of danger all around them. Another sense of danger below them. And a sense of danger on the other side of the book cases, which was the area of the chamber out of view. It was these factors that lead him to conclude that perhaps the Doctor was right, and it was probably a good idea to leave after all. Interestingly, he noted, he did not get any sense of danger from Doctor Lobe himself. “Not necessarily,” said the Doctor. “Will I regret it?” he asked. “Most definitely, I'm sure,” said the Doctor. “Forever?” asked Hermel with a quiver in his voice. “Did you find out what happens when time runs out?” asked Lido. “Yes. Yes I did,” replied the Doctor who at that moment took on a distant look that conveyed something of horror and deep curiosity. “Ok! That’s good enough for me! I think we should leave now, friends,” concluded Lido suddenly. As the two Hobbits turned to leave, and Hermel eyed the book stacks planning a desperate and probably stupid move, Jeremy spoke up for the first time. Jeremy was crushed. His hope was to stay as Doctor Lobe's assistant so that he could make sure that Jeremeze was healed and made whole. Lido saw his expression and returned quickly, took him by the hand, and offered consoling words to the effect that Doctor Lobe would take good care of Jeremeze, and that it truly was time to leave. Jeremy followed him reluctantly, turning to look behind him one last time at his twin laying on the table. And with this, the Hobbits and Jeremy exited the room, Ishcandar taking a final longing look towards the Radio Frequency Triangulator on the desk, noting that the lights were blinking in a rapid fire red, blue and green blur. As they left the chamber, Hermel made a quick sudden dash for the bookcases. He wanted to see what the source of the danger was on the other side, thinking that this would lead him to understand who was behind Doctor Lobe’s activities. The books on the shelves whizzed past as he ran, and finally he came to the end of the row and stopped before peering around the corner of the bookcase. There he saw standing just off to the side, Yakov in his white lab coat. He seemed to have stepped off of a five sided metal plate on the floor that Hermel glimpsed as a purple curtain drew closed concealing it from view. Yakov immediately noticed Hermel and began to walk brisky toward him, his hunch back rolling along as he heaved his body forward erratically. That was enough for Hermel. He cut and ran back the way he came, wished the Doctor a nice day, and ran through the door and down the stairs. Everyone was clustered at the bottom waiting for him, and he only said that he was being chased by Yakov to inspire Ishcandar to use the key to open the door and get them into the empty chamber on the second floor. Hermel still felt danger below them, and around them, and above them now. He suggested they try their luck downstairs. So they ran to the next door, Ishcandar opened it with the key, and they ran down another flight of stairs. Having decided that attempting to exit through the Tower’s front door would be too dangerous, the party ventured down the flight of stairs to the basement level. There they found an octagonal stone walled room lit by a gas lantern on the north wall. The door clicked shut behind them. Since he knew the way to open the secret panel they didn’t delay. Hermel went to the unlit lantern on the south wall and turned it clockwise as Jeremy instructed. Sure enough there was a click, and a panel of stone slid sideways to reveal a tunnel. The tunnel was dark. In the meantime Ishcandar and Lido checked the room for any items of interest, and what they found were a set of crates neatly stacked on the floor. Ishcandar opened one with his handy crowbar and pulling away the straw stuffing found inside sets of components that looked like parts of machines of some kind. He could not tell what they were, or what they could possibly be used for, but he grabbed as many as would fit in his backpack and stuffed them in. Lido meanwhile was looking around for anything else of interest, but the only objects in the room were the crates. Having finished there, they decided to continue into the tunnel in the hopes that they would finally be able to locate the Hagglesmiths, now that they were actually on their trail. Lido, with his map making skills was able to ascertain that the tunnel ahead should in all likelihood lead into the basement of the Five Crows Tavern across the street from the Bridge. He also decided it would be wise to check for traps along the way down the dark tunnel, and indeed within ten feet of the door he located what looked to be another gas lantern trigger. He began to notice that some of the gas lantern fixtures were worn on the bottom side, which he now took as an indicator that they were in fact triggers of some sort. They decided to try it. Uncertain whether or not the lantern would trigger a trap or a secret door, Hermel motioned for the others to move further down the tunnel while he tried the trigger. It turned, there was a click, and another panel of stone slid to the side on the opposite side of the corridor from the lantern. Hermel, surprised, quickly turned and threw his shield up on that side, however, the door opened onto a long dark corridor in which there was nothing but silence. After a few moments everyone began to breath again. The group had a protracted discussion as to all of the factors involved thus far, including their primary goal which was to find the Hagglesmiths, as well as their secondary goal to discover and map the underground tunnels beneath Dunn’s Bridge. They decided to explore the long corridor. To safeguard their way of retreat Hermel thought it would be wise to take some crates from the Tower’s basement room and block the secret door with them so it would remain open. However, when he turned around to reenter the room he got a strange feeling that all was not right somehow. The room seemed oddly shifted in a very peculiar way as though everything in it, the walls, the light, the crates, even the air itself were somehow being very slowly twisted into a kind of bizarre multi-dimensional vortex. On top of that odd impression, he noticed that the light in the room had become a shade of blue that signified something was happening there that stopped him in his tracks. As he looked the strange twisting continued to deepen, and he began to feel a sense of nausea. As soon as he felt that he turned away with a sudden twist, and waked the ten feet or so back to where the party was crouching at the head of the newly opened long corridor peering into the darkness. “I think we should leave the Tower room alone,” said Hermel quietly. Since he could not articulate what had happened to the basement room, nor was he sure he hadn’t imagined it somehow, he simply said that something odd was happening there, and they left it at that. The Lido bravely crept down the long stone corridor alone, having been selected to scout it out in advance of the rest of the party. Silently as possible he slinked along by the flickering light of his torch, poking the wall stones for any hint of traps, and went on for eighty feet at which point he stopped in front of a large stone archway. This was sealed off by a huge iron gate whose bars extended from floor to ceiling, beyond which he saw a narrow landing with stairs going down to the left, and beyond that cavernous darkness. To the right, however, there was an open section of corridor that lead to a stairway going down another twenty feet. He examined the gate, on which he found a very old style lock, very sturdy, which sealed the gate shut. Lido decided to go back and bring Ishcandar, who had the key he’d pilfered from Yakov which had opened all the doors in the tower thus far. However, this lock it would not open, and despite his best efforts at lock picking, he could not open it. To the right, however, there was the flight of stairs going down leading into another corridor. So the two Hobbit heroes crept down the stairs and to the edge of the T-Section. Johan, who was deeply curious for his own reasons, had also followed behind at a discrete distance. Lido carefully searched for any sign of traps at the bottom of the stairs. He saw none. The two Hobbits quickly poked their heads around the corners of the corridor glancing rapidly in both directions and then pulled back. To the left Lido saw a pair of ornately carved wooden double doors, which were closed. To the right Ishcandar saw a long corridor vanishing off into darkness. The doors, thought Lido, looked vaguely familiar. “Those doors… they look familiar to me,” he whispered to Ishcandar, who suddenly recognized them as the very same doors that they’d seen in the secret study that Bernie had lead them into from the sewers the day before. “Ah, yes, of course,” replied Lido after Ishcandar explained. They crept forward carefully, scanning for traps at each step, and within a few moments found that Yakov’s key opened the doors. They were not surprised. Into the room they ventured, while Johan stood guarding the doorway. They found that the elegant little study had been put back in order, and the desk was returned to it’s original place, and the cabinets had their bottles of liquor returned to them. It was as if they’d never disheveled the room to begin with. Ishcandar went to the desk to inspect it and found that even the drawer that he’d smashed open with his crowbar had been expertly repaired so that it looked brand new. He was a little surprised. He thought he might take another peek inside, and so he fiddled with the lock and pulled the drawer open. There was a sudden ‘ting’ sound and he felt a quick prick on his right forefinger. A needle had pierced it. He shouted and fell backwards. He watched in horror as his finger began to turn black, and excruciating pain seared up to his elbow. Johan leapt to his side. Within moments, however, Johan with his mystical healing art was able to stay the poison so that it ceased to spread further. His finger remained black, but the pain was gone. “A most unpleasant surprise!” he said as he stood up. “I could certainly use a drink, I should say!” as Johan guided the young Hobbit toward the doorway. Lido, who was never one to deny his friend his due, went to the cabinet and opened the glass doors. He looked over the various bottles, of which there were plenty, and decided that the closest one, a fine brandy, would do nicely, and pulled it off the shelf. It was, however, attached to a string, which once pulled tipped over another bottle, which began to pour a clear and potent alcohol onto the large ornately woven red and gold carpet that Lido was standing on. At the same moment a small flair ignited and dropped a lit match at the base of the cabinet. There was an explosion of yellow fire, and Lido found himself enveloped in flames, along with the entire area of carpet he was standing on. Not one to dawdle under such circumstances he leapt away from the cabinet, off the rug, and onto the stone floor of the corridor where Johan and Ishcandar were standing. The doors to the room suddenly snapped shut just as he leapt through in the very nick of time. There was a click as the double doors locked shut. Had he not moved immediately Lido would have undoubtedly been trapped inside the flaming chamber. The three adventurers managed to smother the flames, and though his cloths and hair were burned, with Johan’s help he did not sustain any significant injury. It was a very good thing to have a mystic healer along, thought Lido to himself as he thanked Johan profusely. They watched as the double doors began to smoke, and decided there was little point in remaining, and so they began to head back the way they came. Ishcandar, however, was too curious about what was at the farther end of the dark corridor ahead, and so while the other two ascended the stairs he quickly and quietly trotted down the long corridor to find that it ended after eighty feet in two large red double doors with bronze studs riveted into its heavy wooden cross beams. Above the door there was a red sign with gold lettering that read “Five Animals Hall”. He listened at the door and from the other side he could hear the sounds of grunting and panting. Perhaps it was men training, he thought. He was unwilling to try the door to find out, and so he trotted back the way he came, and brought his report to the others who had reached Hermel and Jeremy at the entrance to the secret corridor. At this point they felt there was only one way to go, and that was forward toward the secret panel that Jeremy said was at the far end of the corridor they were standing in. There would be another gas lantern, which would open the secret door into the room where the Hagglesmiths had been captured a day ago. Hermel took a final glance at the Tower basement room’s open doorway, and it still had the same strange blue tinge as they went in the opposite direction. They got to the far end of the corridor, and sure enough there was another gas lamp on the wall, and when they turned it there was a small click and a stone door cracked open. Lido held it so that it would not open all the way and peered into a large square room ahead. In that room they saw three men sitting at a table playing cards. It was a basement cellar, stocked with kegs of beer, cases of wine on shelves, and a case of liquers along the far wall. Huddled together on the floor were several children bound hand and foot with scarves tied over their mouths. None of them were moving and all of them had their eyes closed. As the Adventurers exited into the corridor from the cave-chamber, Ishcandar went to retrieve his dagger from the body of the yellow spotted toad that he had pinned to the floor with an artful throw. He considered that the slimy substance clinging to the blade would likely contain the poison that had so adversely effected Hermel’s arm, turning it a shade of pale blue and rendered it entirely paralyzed up to the shoulder. Without hesitation he cut a cloth strip from Herme’s shirt, and carefully wrapped the dagger in it, on the hopes that the poison would dry and become useful later, saying unabashedly, “Don’t worry, Hermel, you won’t be needing that shirt for much longer it seems,” in his usual playful tone. Hermel glared at him for a moment and then turned toward the door that lead into the corridor from whence they came, sweat beginning to pour from his face, neck and aching limbs. The discoloration of his arm was beginning to spread. He was short of breath and staggering as he made his way into the dimly lit corridor. Lido had taken the torch and was leading the way back toward the laboratory. Ishcandar helped Hermel to hobble along, noting to himself the sounds of croaking toads emanating from the archway that lead into a dark corridor out of the cave-chamber about twenty feet away on the opposite side of the room from where they were exiting. “Sounds like the yellow spotted toad has plenty of friends back there,” he commented with a shudder as he closed the door behind them, listening for the metal click that indicated that the door’s lock had set in place. As they made their way slowly down the corridor toward the lab, Lido noticed that a light was shining from beneath the door. He stopped. That should not have been the case as they had instructed Jeremy to stay at the top of the stairs to back up Bernie and ensure that the huge metal door that lead into the lab would not close, and to shout in the event anyone was approaching. Holding his breath Lido quietly pulled the door open. There they saw Jeremy standing next to the metal table in the center of the laboratory. Having pulled the canvas sheet away he was looking with horror at the body of the boy lying there. “We have to go,” said Hermel. He paused, despite the terrible numbness of his arm, to consider Jeremy’s fixation of horror. One of the reasons he had wanted Jeremy to stay behind was to spare him from seeing the dead boy. “Did you know him?” he asked. Jeremy’s eyes were fixed on the blue bloated face of the boy lying there. “It’s me,” he said with a combination of terror and bewilderment. Hermel looked at the body very carefully though his vision was blurred and his head was aching. Despite the blue discoloration, and the bloating, he could tell that it did actually look like Jeremy. In fact, the wispy blondish hair, the shape of the eyebrows, the split between the teeth, even the odd cleft in the chin… his features were exactly the same as Jeremy’s. He got a shooting numbness down to his little finger. “Let’s go,” he said and began making is way to the stairs that lead up to the second metal door. “Yes, I think so,” answered Jeremy vaguely, still staring at the boy’s face as he backed away toward the stairs. As he passed the body on the table, Ischandar noticed the arm twitch. He was startled. “It moved,” he shouted as he jumped away from it. “Take it,” said Hermel still shuffling toward the stairs. “Take it?” asked Ischandar incredulously. “Yes, take the body,” answered Hermel firmly, taking the torch from Lido in his good hand and continued toward the stairs. And so Lido and Ischandar, the two Hobbits, lifted the body from the table, and carried it between them while Jeremy followed behind. When they got to the stop of the stairs they heard Bernie talking. “You’re a very clever rat, aren’t you?” he was saying. Hermel entered the room to find Bernie talking to his pet rat whom he was holding in his arm. Everyone followed Hermel into the room. Bernie looked up and seeing Hermel’s arm looking blue and bloated, and the two Hobbits carrying a body between them that had begun twitching, raised an eyebrow and put his rat into his vest pocket. “Oh my. We should probably be making our way home, eh?” he asked. “Is there anything you can do for my arm? I think I’ve been poisoned by a toad,” asked Hermel. “No, I can’t do anything for that here, I’m sorry,” replied Bernie after looking over the blue welts on Herme’s now entirely numb arm. “What about this guy?” asked Lido turning himself so that Bernie could see the boy on his back. Bernie came over and took a quick look. The boy was twitching, and one eye half-opened, and his color was pale blue on his torso, neck and arms. “I’m not too sure what’s wrong with him, so no, I don’t think I can help this guy either. In fact, if I don’t miss my guess, you both have the same ailment, whatever the hell it is,” he said. No one said more about that, but instead discussed whether or not it was wiser to wait and see if the boy and Hermel would both recover, and then continue their exploration than it would be to leave and seek help back at the Guild. Hermel had already noticed that the numbness had stopped growing any worse. Seeing as how the boy was recovering, he estimated that the yellow spotted toad’s poison was not fatal. But he could not be sure. “Well according to folklore in my home village changelings switched at birth. It's a fact that that happens sometimes,” replied Hermel thoughtfully. “Well maybe, but if I find somebody who looks exactly like me in the basement laboratory of a mad scientist, I’m going to blame the mad scientist,” said Lido. “Why don’t we ask him when he wakes up?” suggested Hermel. “Here’s the thing,” replied Hermel with a long pause. “If we go upstairs, … I don’t think we’re going to come back. This is probably our only chance to explore this place. Once we leave then our presence here will be obvious, if for no other reason than the broken desk drawer and the mess we made down here,” he concluded looking around the elegant library with the rifled cabinets and broken desk that they’d slid in front of the double wooden doors through which they had not ventured. “We have no choice but to get out of here. The only problem is going to get the kid up the ladder out of the sewer tunnel to the street,” said Ischandar watching the boy twitching his arms and legs and lolling his head around. “Oh we’ll get him up the ladder”, said Hermel. At that moment the boy moaned. Everyone looked at him. One eye was open and slowly rolling. After a few moments his other eye opened. Hermel, who had heard frightening stories about the living dead wished to know if the boy was in fact alive, and so he bent his head to his chest and listened. Indeed he heard the thum-thum-thum of a beating heart within. Ischandar, thinking quickly, went to the cabinet and took out a bottle of brandy and uncorked it. He gave the kid a swig of the brandy, himself another swig, and corked the bottle back up. Somehow the decanter landed in his pocket but later he could not recall putting it there. The brandy tasted very warm and soothing going down. In a few minutes the boy was able to speak a few words, though faltering with heavy moans, and Ishcandar in a fine mood began smiling to himself. “Who are you?” asked Lido. “And who is this,” asked Hermel pointing to the real Jeremy. “Ohh… I don’t know,” replied the boy with a moan, now bewildered. Jeremy stood flabbergasted. He could not for the life of him think of what to say. Turning toward the boy, Lido asked what the last thing he remembered was. “Ohhh… I must have left the lab door open… the frogs came in…”, he said moaning again. “Were you working for the Doctor?” asked Lido. “I’m his assistant,” replied the boy sticking out his little chest proudly, and then falling back into a slump. “Bernie, can you explain this?” asked Ishcandar. “How long have you known Jeremy,” Ishcandar continued. “Oh about two years or so,” replied Bernie. “Um… You don’t know this, but Jeremy’s parents died when he was a baby. He’s an orphan,” said Bernie quietly, looking at the two boys, mirror images of each other. Everyone was silent for a few moments. Ishcandar then walked to the large metal door, perhaps to distract from the awkward topic, closed it and bolted it shut. “Well, at least we know why they had to bolt the doors from the inside. To keep the damn toads out,” he concluded. It did seem like they were rather enormous metal doors for that purpose, nor did it explain the air tight rubber seals around the doors, thought Bernie, but he declined to mention it. “So we’re going to get blue Jeremy out of here and hope he has some sort of insight and then come back again later? I think we’re pushing our luck,” said Hermel. “We’ll have to find another way in,” said Ishcandar. “And as the assistant of Doctor Lobe, he should have intimate knowledge of the layout of this place,” added Ishcandar. “We can try a con game on them. We tried before and they wouldn’t talk with us. But now that we have the Doctor’s assistant, perhaps they will,” said Lido. The boy looked confused for a few moments, but then seemed to recall something and replied that the Doctor had spoken about some “guests”, and perhaps those were the Hagglesmiths, but he had not seen them himself. Hermel noticed that the boy had come around quite a bit, and his color was better, and he seemed as though he might soon be able to walk. Ischcandar, seeing as how the boy was only clothed from the waste down with pants and was shivering, gave him his cloak. “What’s beyond the double doors?” they asked pointing to the ornately carved locked double doors that they had not yet opened. “They go upstairs into the tower,” replied the boy. “What day is it?” asked Hermel. “I don’t know,” the boy replied. “What happened on the day that you became the Doctor’s assistant?” asked Lido. “I don’t remember very well. He asked me to do some work for him, and so I did,” came the boy’s reply. As they were talking Ishcandar went to the double doors to see if he might hear anyone coming. As it happened he did. There were footsteps approaching from beyond the doors. “We gotta get out of here. Someone’s coming,” he whispered loudly. They quickly left through the secret door, and Bernie clicked the mechanism locked behind them. They were back in the dank and foul smelling sewer tunnel looking through the darkness toward the ladder that led up to the street. Lido listened for any sounds that might present an obstacle, in particular any croaking sounds. The sewer was empty. “Well, I think we should go back right away to Hagen,” said Ishcandar thinking that they could get help and provisions there, and that Hagen might know more about Jeremy. Meanwhile Hermel was inspecting his arm and felt that the numbness was going away and his natural color returning slowly. Once they got up the ladder and into the alleyway next to the Five Crows Tavern, the group decided to head first to Hermel’s apartment so that the boys could rest. Down the alley they went, across a small cobblestone street, down some worn stone stairs, through a tunnel streaked with mud and down another street, and finally came to the apartment building. His flat was on the third floor. They sent the two boys up with Lido and Hermel to his room. Lido was to stay outside the door to listen at their conversation, just in case there was foul play between them. The flat was just a single room, with no particular amenities, a broken mirror, a straw on the floor for a bed, and a narrow window overlooking an alleyway. The rest met downstairs outside and waited for a few minutes. Bernie had been left behind to watch the street to make sure they weren’t being followed, as they had some concern that Doctor Lobe might have sent someone after them somehow. It appeared their apprehension was unjustified. Upstairs Lido listened at the door, and caught the boy’s conversation. “You look much better now,” said one. “I feel much better, thanks,” replied the other. “But I’m Jeremy,” said the other. “I’m tired. I want to go to sleep,” replied Jeremeze weakly. “Ok well you rest,” replied Jeremy, and the conversation ended. Downstairs the others conversed with Bernie and filled him in on all the details of their adventure down into Doctor Lobe’s laboratory, and the tunnel beyond. Bernie listened to the story impassively. He seemed little impressed. Ishcandar took a swig of the brandy he found in his pocket and put the bottle back. Brandy never failed to bring a smile to his face. Lido went downstairs and related to the group that the conversation between the two Jeremys indicated that they were not trying to deceive the group, but that they sincerely didn’t know of each other’s existence until introduced in the laboratory. He also wondered that there should be two exact likenesses of the same boy, and supposed that it might be some kind of black magic, or strange science. Everyone agreed that there was definitely something strange about it all. “For all we know the Doctor could be a mad scientist and the new Jeremy a human-toad,” said Ishcandar. “The Temple of Divine Harmony, of course... everyone knows the golden Elkron of the Sun hates black magic, for sure,” said Ishcandar. “Maybe we should go there and ask them for help,” said Hermel. “Maybe we should go to the Guild first,” countered Ishcandar. “Yeah, going to the Guild would be a good idea,” answered Hereml. They decided to go the Guild first, and then pay a visit to Hagen at the Rats Den afterwards. And so they collected themselves together, sent Hermel to wake the boys up, and headed to the Guild Hall, which was not too far through the winding alleys of the Old Quarter. Hermel returned to his apartment to fetch the boys, now that they decided that they’d learned enough. Jeremy was sitting on the floor looking out the window, while the other Jeremy was lying on the straw mat sleeping. “What did he say?” asked Hermel Jeremy. “I’m smarter than he is,” commented Jeremy matter of factly. “How long have you been on your own, Jeremy?” asked Hermel. “All my life,” the boy replied proudly. Hermel woke up Jeremeze and gave him his one extra shirt to wear (the one with the hole), as the boy, who now had a much better color, awoke slowly and sat up with his back against the cracked and stained wood paneled wall next to the straw mat. A fly buzzed around from behind Hermel’s head and landed somewhere in his hair. He swatted at it unconsciously and forgot about it as a crow flew past the window casting a shadow across the floorboards. Jeremeze yawned and stretched slowly. Gray clouds moved gloomily across the sky, and the wind outside howled eerily through the branches of the tree in the courtyard. Time seemed to move very slowly just then. They left the apartment and headed down the winding streets and through the alleys toward the Guild Hall. All the way Jeremeze trundled along half asleep. “Maybe he needs something to eat,” offered Lido. They passed a man selling rat-sticks from a stall. Hermel ordered three. Bernie, holding his pet rat in a fold of his vest stepped away across to the other side of the alley and stood in a shaded doorway scowling at the vendor. “Here you go, boys” said the grizzly old coot holding out three sticks with roasted rats stuck on them, “Rat Sticks! You’ll like em!” They got them with the sauce, which looked a bit like browned blood with seeds in it. The kids ate them greedily. Hermel enjoyed his with a leering smile toward Bernie, who gave him a nastier than usual glare. Off through the back streets and alleys they tromped and finally came to the ivy and moss-covered Guild Hall and stood on the three steps where they first met Jeremy. It was about six thirty at night, and the sky was beginning to grow dark. Lido looked around to see if anyone had taken any particular note of them, or the two Jeremys, but no one at all took any notice of the little band of ragamuffins, so common a site was it around Hobbington. They walked up the short stairway, knocked, and the Guild Secretary met them at the door. “Ahh, if it isn’t Group AAA, returned at last,” he said amiably. “Welcome back, … Jeremy… and … um… Jeremy…” he said with a raised eyebrow. “That’s why we’re here,” said Ishcandar. “I see. Please wait here, and I will let Rothmon know you have something interesting to show him,” he said and ushered them into the foyer. He went upstairs, while the boys sat on chairs lining the narrow hallway. Rothmon soon came down. “Gentlemen, you’ve returned,” he greeted the boys with is usual warm yet sober tone. He asked them to join him in the study. It was only then that Hermel and the others noticed that they’d lost Bernie somewhere along the way to the Guild Hall. Ishcandar guessed that he had headed back to the Rat’s Den to confer with Hagen. “We made our way down to the tunnel beneath Dunn’s Bridge with our friend Bernie’s help, and once inside we made a startling discovery,” began Lido. “Did you make a map?” asked Rothmon, interrupting gently. At this Lido stopped. He looked down at the floor, and then hit his forehead with his palm. “No, I completely forgot in the excitement!” he said with great embarrassment. “I can make one for you now from memory,” he added hastily, and quickly sketched what he could recall on a piece of paper. It was only vaguely accurate, and Ishcandar made several corrections to Lido’s draft, which also happen to be incorrect, and so the map turned out to be quite inaccurate in many details, but was still somewhat serviceable as a starting point. Nevertheless Rothmon took the map, wrote something across the top, and explained that he could only offer them a “Grade D Rating” on it, since it was from memory, and those had proven over time to be not so very accurate usually. He would provide them with a small payment later. They then explained everything that happened in great detail. Ishcandar gave Rothmon the letter he had pilfered from the ornate desk in the secret room. The old gentleman read it with great interest, and said that it was an important find, even though he didn’t quite understand the implications as yet. He put the letter in his desk drawer and they went back to discussing the two Jeremys. Lido then gave Rothmon a thorough accounting of the details within the laboratory, and the corridor that lead to the cave-chamber where they encountered the yellow spotted toad that had attacked Hermel. Ishcandar made a point of mentioning that there was a drain in the ceiling of the laboratory, which they all considered rather strange. They described the yellow spotted toad with the gray-green skin and red eyes, and Ishcandar handed Rothmon the dagger that had slain the toad which he thought may still have the poison on it, wrapped in the cloth he had torn from Hermel’s sleeve. Rothmon inspected it carefully as they continued the story. They described exactly how they met Jeremeze, and how they rescued him, and everything that was said. Lido conjectured that the boy may be a duplication of the original Jeremy that the Doctor must have somehow have created. “It certainly bears further investigation,” commented Rothmon after a short silence. “Were you able to locate the Hagglesmiths?” he asked pointedly. “No, we only got so far before we had to return due to Hermel’s injuries. Thank goodness Hermel’s paralysis has worn off. We were quite worried about it at the time,” said Ishcandar. Meanwhile, as Ishcandar and Lido explained what happened in the secret chambers, Hermel thought it a good idea to take the two Jeremys to the famous Adventure Guild Bar and Grill they had heard so much about. Ishcandar gave him ten iron pieces, which he thought should cover the cost for Hermel and the two boys meals. That was very generous of him indeed, and so Hermel headed off to the Bar and Grill. It was an utterly beautiful setting, with deep dark woods, candles and glass lanterns, and a deep plush red carpet covering the blue-gray granite stonework in long luxurious strips throughout the restaurant. Off on one side was the bar itself, an enormous affair lined with a bronze railing, and around which were booths and tables, some large and some very private and cozy. And the aroma as one walked in was mouth watering with the scents of herbs, breads, sizzling meats, and spiced drinks. They were seated in a semi-enclosed booth and a lovely young lady came with a menu and crystal glasses of water. Since he could not read the menu, Hermel simply looked at the menu for a moment, and then asked the attractive waitress to order for them. “I trust your judgement,” he said. She smiled and hurried off taking the menus with her. Soon the lovely waitress brought them plates of bread with three flavored butters, a bowl of shelled walnuts with honey glaze, and then perfectly cooked char grilled steaks sizzling in butter and herbs, with crunchy-crusted baked potatoes and sides of broccoli and caramelized onions. She also brought them drinks of orange-tangerine juice and milk for he boys and a tall mug of fine ale for Hermel. Everything looked and smelled delicious! Hermel let the boys attack the food first, and they grabbed at the steaks with both hands and immediately began gnawing on them greedily slobbering and making all kinds of loud sucking, slavering and chewing noises. “Gentlemen, Gentlemen!” Hermel interrupted them. “...One hand clean,” he said raising his left hand in the air demonstratively, “please… like Civilized people,” he concluded, and made an example of eating his steak politely with one hand, instead of two. The waitress happened to walk by staring at them out of the corner of her eye, and Hermel gave her his politest, though bespattered, smile and a big cheerful wink as he waved his clean hand at her. She hurried off to serve other customers. The boys were very impressed by this but ignored his gentlemanly advice completely as they continued to wolf down everything on the table to the bottom of the bowls with wild abandon. Hermel was at least gratified that they truly enjoyed the meal. It was surely the best that any of them had ever had. Yet, despite all of the great food, it seemed to Hermel that Jeremeze was not really coming out of his stupor. The food was gone, and the poor boy seemed to be falling asleep. Perhaps he’d eaten too much, thought Hermel, though Jeremy was quite awake and eagerly looking to order more steaks. When it became clear that that was not going to happen Jeremy made a point of politely wiping his bespattered hands on his shirt and smiled proudly, looking to Hermel for approval. Hermel nodded with a smile and did the same, and they both sat grinning happily as the nice wide-eyed waitress walked by trying hard not to stare. Meanwhile upstairs the whole story was told and so the group decided it would be a good idea to introduce Rothmon to the new Jeremy. The all came together down to the Bar and Grill. Rothmon was introduced to the boy and gave him a courteous greeting. “Good evening, young man,” said Rothmon. “Good … evening… sir,” replied Jeremeze drowsily, lolling his head against the tall dark wood of the booth. It was decided that Jeremeze should be taken to the Guild Doctor, whose office was on the third floor. 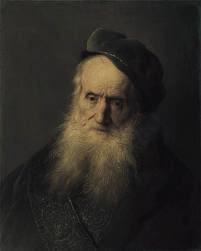 His name was Doctor Sniloc, a known curmudgeon, quite cantankerous, yet with excellent eye for illnesses, and expert at setting bones, curing diseases, surgery and the like, and by some accounts the best doctor in the vicinity. They settled up the bill, which unbeknown to Hermel came to a somewhat more than the 10 Iron he had, but Rothmon quietly picked up the remaining tab and added a rather handsome tip as well with a look and wave to the maitre de. The waitress smiled and prepared to head off to attend her other duties. “Well, good bye,” said Hermel to the pretty young waitress. “That was good. Thanks. Real good. Thank you,” he half stammered. “My name is Hermel,” he added awkwardly. “I’m glad you enjoyed your meal,” the girl answered politely. “And I am Ishcandar, of High Ridge,” said Ishcandar cutting in-between them and taking her hand with a bow, and kissed it politely. “Nice to meet you, Ishcandar,” she said with a smile as Hermel gave the little Hobbit a rather savage glare. “Are you a member here?” she asked. “Not as of yet,” he replied, “but I could be persuaded to join soon,” he added with a slight bow. She was suitably flattered and walked off with a smile as Hermel cast all kinds of nasty looks at Ishcandar while they exited the lovely restaurant. “Are you ok?” asked Rothmon of Jeremeze. “I’m just sleepy, that’s all,” replied Jeremeze. “I think I need to get back to the doctor soon,” he continued. “I don’t think he will do,” said Jeremeze, “but ok.” At that point poor Jeremeze collapsed on the floor. And so they carried the boy up the flights of stairs and took him down the hall to the doctor’s office. There was a wooden door with a frosted glass pane that read “Doctor B. Sniloc, PhD, MD, MSON, BSc, DMD, OD, D.Pharm, MBBS”. Inside was a doctor’s office, very neat and clean and tidy, with lots degrees in frames on the white walls, large cabinets with labeled wooden draws, medical equipment, scales, a cloth covered table in the center, six wooden chairs on the side, and two frosted glass doors leading to other rooms. There was also a pretty secretary who greeted the party as they entered, and quietly summoned the doctor. Doctor Sniloc entered the room from an inner doorway, his long white beard neatly combed, rubbing his bronze rimmed glasses with a white cloth. He put them on, and seeing who had come in, gave a gruff but efficient greeting to Rothmon, and the others. “Good evening, Barnebus,” said Rothmon to the doctor politely. “What happened to him?” he asked curtly as they laid Jeremeze on the table. “His name is irrelevant, get on with it,” stated the doctor waving his hand in the air dismissively. Doctor Sniloc stroked his long white beard and then took the boy’s wrist in his hand and closed his eyes and counted under his breath. He took a long tube and put it to the boy’s chest and listened at the other end. He lifted each arm and leg, felt the boys’ forehead, looked at his skin all over, and then went back to holding his wrist. Never a word did he say until he was completely and thoroughly finished. “I’m sorry to say, but this boy is dying,” he said matter of factly. The doctor gave a long and elaborate diagnosis with many words that had far too many syllables for the boys to follow. Needless to say none of them had any idea what he had said, but they believed every word of it just the same. “Perhaps we should bring him back to Doctor Lobe?” said Lido. “Do you happen to have a cart we could borrow?” asked Hermel. “Why yes, there is one downstairs in the barn next to the Guild Hall,” said Rothmon with a doubtful tone in his voice. “Very good. Now, is there anyone who could help us with this dabbling in nasty magic?” asked Hermel. “Perhaps we could go to the Temple of Divine Harmony and find a cleric there who could heal him.” suggested Lido. “His condition is hardly spiritual malaise,” replied Doctor Sniloc with a condescending huff. “I’m reasonably certain his ailment is entirely physiological. A round or two of hocus pokus from some cloud-minded wizard uttering peeps and whistles will not do very much for him, or anyone else for that matter, I dare say,” he said with a harsh laugh. “There is nothing you can do Doctor?” asked Ishcandar. “I don’t believe his condition is necessarily hopeless. I could certainly try, but I could not guarantee anything,” he replied. “Well, somehow I begin to believe that his condition is tied to Doctor Lobe, and so perhaps we should…”, said Lido before being interrupted by Doctor Sniloc. “Why yes, you see we found the boy in Doctor Lobe’s secret underground laboratory. Incidentally, this boy is identical to this other boy here,” answered Lido pointing to Jeremy. “Why that’s quite impossible,” replied Doctor Sniloc. “Doctor Lobe is dead,” he said with grave finality. There was a long silence in the room as everyone stared at the Doctor incredulously. “I did the autopsy on him myself. He died a year ago,” he said finally. “Of what?” several of them asked at the same time. Again there was a long silence. Hermel watched Jeremy, who stood staring in utter disbelief. Ishcandar felt his own pulse. Lido was the first to speak again and asked Rothmon if he had known of Doctor Lobe’s demise. Rothmon was taken aback at this news as well. He stammered and said that when he received the information regarding the capture of the Hagglesmiths from Jeremy he failed to recognize the connection between his somewhat garbled description of the events, and the Doctor Lobe of former fame. He’d rather passed over that point of detail, and this is why, he explained, the Guild does not allow uncharted missions. “Improper analysis can often lead to just this sort of mistake,” he concluded, looking a bit annoyed. “What kind of man was he?” asked Hermel of doctor Sniloc. “He was very dedicated,” replied the doctor. “One of the best and brightest, really,” he added somewhat wistfully. “Was he a good citizen?” asked Hermel. “That’s possible,” agreed Rothmon. “And perhaps makes some sense. Whomever might be masquerading as him, also might happen to be the murderer,” he went on thoughtfully. “Jeremy, could you please describe what the Doctor Lobe you met looked like? Be as detailed as you can,” suggested Lido. Jeremy described the Doctor as a tall man, with a narrow face, straight nose, cheeks peppered with pot marks, long black hair which he let fall over his shoulders, and added that he wore white gloves, a white lab coat, and carried a gold rimmed monocle on a gold chain. Doctor Sniloc confirmed that this sounded quite precisely like the Doctor Lobe he had known. “So either Doctor Lobe’s twin brother took up residence in the tower, or it’s magic,” concluded Lido. “Perhaps. Either way, we need to help Jeremeze, and so far the best guess we have is that he needs to be taken back to Doctor Lobe for help of some sort. After all, as far as we know, Jeremeze is Doctor Lobe’s creation, and maybe he needs to attend to it,” said Hermel growing impatient. “What do you think of all this Rothmon?” asked Ishcandar. “Lets get the boy on the cart and get him to Doctor Lobe. It’s his best chance,” Hermel was saying as he left the room to go prepare the cart. “We could have Jeremy take Jeremeze inside to Doctor Lobe,” suggested Hermel. “Rothmon, by chance would there be anyone here who happens to be a holy person, someone who might be inclined to help us against black magic, if that is indeed what is going on here… would there be somebody like that here?” asked Lido. “Why yes, there is a priest of the Temple of Divine Harmony training at the moment in the chambers on the third level," replied Rothmon. “Might we ask him to join our A.A.A. Group and thereby to requisition this person on our unofficial mission?” asked Lido. “Ohhh… is that what you call yourselves? We had been calling you the 'Ahhhhh Group'. So it is ‘A’ ‘A’ ‘A’. I see,” said Rothmon with satisfaction. “A fine name then,” he added smiling. "And as for requisitioning him for an unofficial mission, it is irregular, so he would have to agree. But knowing him, I suspect he will." “Might I go and fetch him?” asked Lido, annoyed now that they had not yet selected a better name for their Adventure Group. “I think we had better call for him to come to us. It might be too perilous for you to venture down to the third level yourself. The things that they practice down on that level are potentially dangerous,” replied Rothmon. And so they sent for the Priest of Divine Harmony who came forthwith and arrived at the door to the Doctor’s office wearing his priestly robes of red, yellow and white. He and the Doctor exchanged glances, and Doctor Sniloc continued to work on his analysis of the test tube in which he had poured a bit of the poison that he’d swabbed from Jeremezes’ chest. The red liquid inside began to froth and he grunted to himself. The elderly man at the door bowed to Rothman, and in turn the Guild Master greeted him warmly. “Good evening, Johan,” said Rothmon. “How may I be of service, Guild Master?” asked Johan. The group conveyed the essesnse of the situation rapidly to Johan. “Didn’t you conduct an autopsy on Doctor Lobe one year ago?” asked Johan of Doctor Sniloc. “Indeed, your memory is as good as ever,” replied the doctor and turned to face him with frothing test tube in hand. There was a momentary war of gazes as the two men stared each other down. They both wore grim little smiles. It was a bit odd. “Can you do anything to help the boy?” asked Hermel pointing to Jeremeze who was still lying on the table. Johan placed several artifacts from a bag around the boy’s head, passed his hand over his face and chest, and uttered a melodic incantation under his breath. Doctor Sniloc turned away muttering something about superstitious nonsense to himself, and went back to work. “This is not a boy,” said Johan, to which Doctor Sniloc guffawed under his breath. “What is he?” asked Hermel. “So he’s a Hobbit?” asked Hermel, looking at Ishcandar, who returned a withering look. “Is he dangerous?” asked Ishcandar as he slowly backed away from the table. “We have an impression based on events thus far, that the boy is dying because of his separation from the Tower in which we found him. Do you think that is possible?” asked Lido. “It is. However, I should add that I do not believe the creature is a mystical creation, but rather it is my opinion that he is a creation of some dark science. Doctor, I believe you will find if you conduct the proper study, that the boy is a Replicant,” said Johan firmly. “What? That’s absurd! It’s never been done before! There’s no proof that it is even possible! Ridiculous! I won’t entertain this nonsense for a moment!” replied the doctor rasping at his rival. "Absurd!" “I would be willing, yes. I should be curious to see how things transpire,” replied the priest giving a sidelong glance at the doctor who was scowling as he worked at his test tubes. And so the party left the Guild Hall and took the boy down to the cart and laid him on it. They moved as quickly as they could over the cobblestone streets, passing the shops, which by this time had lanterns in the windows, and tried to ignore the cold drizzle that had begun to rain down from the black sky. They got lost along the way, but managed to find the correct path again in the darkness. The Old Quarter was a twisting maze of back alleys and narrow streets, and tall archways shrouded in perpetual fogs. It was easy to get lost, especially at night, and most people traveling the by ways there wound up confused at some street corner or angled alley, or stairs. Along the way, Hermel mentioned to Johan that he did not himself feel very strong, due to his struggles earlier and the poisoning he suffered, and Johan laid hands on him with a slow melodic chant. In a few moments Hermel came back into his strength again as a golden glow settled on his mind. He felt back to his normal self again. They hurried along their way and finally they found themselves facing Dunn’s Bridge looming in the darkness, barely visible in the fog and darkness. They thought it was still early, but they had not noticed that they’d gotten lost, nor how much time had been wasted seeking their way to the bridge. They then made a plan. It took them some time to contrive it, but eventually they settled on the idea that Jeremy should take Jeremeze on the cart around the side of the Tower to where the door was and knock. Meanwhile the two Hobbits would hide on the bridge in the shadows of another tower, while Hermel and Johan hid in the shadows along the street facing the bridge. If the door opened then Jeremy would shove the cart into the doorway to keep it from closing and give a whistle. The others would then come running to gain entrance to the tower. Having settled on the plan, they set it into motion. It worked almost exactly as they had hoped. Jeremy took the creaking cart around the outer edge of the bridge tower, but found it was too large to fit onto the walkway. Undeterred the boy picked up Jeremeze and carried him in his arms along the iron girded walkway that hung over the dark swirling waters of Dunn’s Brook. He managed to shift his burden so that he could grab the iron lion-shaped knocker and banged it on the door three times, which made a great echo inside the tower. He was quite frightened, and thought of running away, but looking at his other-self lying in his arms so ill, he girded himself up and knocked again. A green light appeared in the window above the doorway. He heard a voice say, “Jeremy, its you. I am glad to see you,” and the door swung open, as Jeremy whistled. “Come in, come in,” said the voice. Everyone ran as fast as they could from the shadows, and made it to the door as Jeremy stood in the doorway. Johan, being an elderly man, was not able to run, so he walked up at a less frenzied pace. “Jeremy! And you! I want to talk to you!” shouted Hermel as he gained the entrance drawing his sword from its scabbard. Inside was an octagonal room with a wooden floor about 20 feet across with walls covered by large hanging curtains of dark purple fabric. There was no furniture. It was lit by gas lanterns, and in the middle of the room there stood a large man with a white lab coat, black shoes and a piece of equipment hung around his neck. He had a wide broad brow, one eye was larger than the other, and he was hunched over on the left side. “You there!” shouted Hermel. The man turned around and began to walk away toward a corner of the room. The large man stopped. He turned around. He looked at Jeremze, at Hermel, at Jeremeze, and he stepped backwards and said nothing. Jeremy had walked into the room, as had Hermel, but the two Hobbits remained on the stoop outside the tower door. They saw the green light in the window and calculated that this is where Doctor Lobe must be. Jakov was making his way around the side of the tower along the iron girded walkway. He looked down into the black waters below with a shudder and kept walking until he came to the two Hobbits. “Shall we go in?” he inquired. And so they went into the room. There was a single wooden door that led from this room, other than the main doorway, and that door was to the right along the wall, below where the outside window would be located. The two Hobbits sidled along the purple tapestries until the came to the door, and checked it. The door was locked. Meanwhile Jakov was backing away toward the rear wall of the room. Ishcandar slid along the wall toward Jakov, and managed to get behind him without his noticing by gliding behind the curtains. Jakov was focusing his attention on the sword in Hermel’s hand and ill-visioned on one side, did not notice the Hobbit's movements. In a lucky maneuver Ishcandar used his skill in acrobatics, and his picking pockets skill in combination to grab the key that hung on a small chain from his broad leather belt under Yakov's lab coat. Ishcandar thanked his lucky stars and ran off along the wall. Yakov turned around to see him running away, clutching at his belt where the key was. He was wroth, but did not lunge forward, as Hermel’s sword prevented him. Ishcandar made his way back to the locked door, slid the the key into the lock, gave it a turn, and with a click the door opened. There was a small landing a long dark stairway going up to the right, and another stairway going down to the left. Meanwhile Jakov had slowly backed his way to one of the tapestries and slipped behind it. Hermel, who was momentarily distracted by the fact that the Hobbits had opened the door, turned to see the curtain closing shut. Cursing, Hermal ran to the curtain and swung it partially out of the way to peer into the other side. There by the light of the lanterns he could dimly see a small room, but Yakov was not in the room. He’d vanished. “Johan,” can you make a light appear? I have need of your power!” spoke Hermel reverently. “Most certainly”, said Johan taking a torch out of his satchel and lighting it on the flame of a wall lamp. “Here you are, my brave friend," he said cheerfully. “Um… that’s good,” said Hermel. “Thank you.” And drawing the curtain back a bit more and sliding the torch within he peered around the small room by the flickering light. Indeed, Yakov was gone. The only thing he saw in the room was a small three foot high column with a flat top and strange markings on the top, and on the floor a five sided metal plate with other similar markings engraved on it’s surface. Other than that the room was empty. And yet, as the Hobbits ascended the stairway on the other side of the tower, and Johan hovered behind him, Hermel began to feel a sense of dreadful danger lurking in the small room before him. He looked around. Nothing stirred. It was empty. He looked down. Nothing. He looked up. 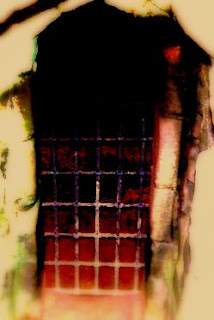 And there on the ceiling he saw an iron grating above which was silently sliding a stone panel very slowly open. Hermel decided that discretion was indeed the better part of valor and backed way from the room, heading to the door where the Hobbits had ventured through. Johan followed closely behind him. As they made their way, looking all around them in every direction, they came to the main door of the tower, and Hermel swung the door open, and then continued on his way to the wooden door. It was still opened a bit, and so he and Johan gained entrance to the stairway and followed the Hobbits whose torch they could see flickering at the top of the landing upward to their right. Meanwhile the two Jeremy’s and the two Hobbits had come to the top of the stairs, and met with another locked door. It was no problem. Lido had a torch lit, and with the key Ishcandar turned the lock and it clicked. He slowly and carefully slid the door open a crack and they peered inside. There was another room that looked identical to the one downstairs. There was no light in this room. It also had a door to the right. As there was nothing in the room, and nothing stirred, the floor was dusty, and so they decided to go to the other door and repeat the process again. Now they made their way up the stairs to the right to the third story landing, and again used the key to open the lock. They peered through the crack. There they saw a room lit by a green lamp hanging from the ceiling. There were several other candles around the room, and a hand lantern lit on a desk toward the right and a table in the middle of the room. On the table were many books and papers. Beyond the table were tall bookcases set in rows, like a library. Just then, a tall man with a straight nose, pot-marked cheeks and long black hair flowing over his shoulders stepped out from one of the rows between the book cases carrying a large leather bound tome in his left arm, and a candle in his right hand. He was wearing a white lab coat, and seemed rather preoccupied with what he was reading. At that moment they heard the tower bell ring twelve times. It was mid morning on the cobblestone street along Dunn’s Street Canal. The patchy fog shrouded the four towers of Dunn’s Bridge, though in the second story window of nearest one a dim green light could be seen. Ishcandar shivered with cold as he wrapped the cloak that Lido had given him around his wet body. His mind was still lingering on the ghostly fish that had attacked him in the dark swirling waters below. Everyone else in the group had focused on the tower window, staring at the silhouette of the figure there. The light blinked out. However, this detail was lost on Ishcandar as he stared downward back toward the swirling black waters to gaze absent mindedly at the ghostly white fish as they floated down stream, leaving trails of crimson streaks behind them. He felt the wounds that the fish bites caused as blazing fiery gashes along his arm, leg and throat, and though he was no longer in peril of his life, he nonetheless was keenly aware that his life still hung precariously in the balance. Or perhaps it was merely the feeling he had then due to his extraordinary effort in channeling his mystical energies into his body in order to keep himself from dying down there in the canal. He wasn’t quite sure. His mind was as foggy as Dunn’s Bridge, and he felt no energy for much of anything, let alone thinking difficult thoughts. But he was aware that a small black sparrow had landed on the stonework next to his right hand. With a strange little ‘caw’ the tiny black sparrow jumped up and fluttered it’s way downward onto one of the floating ghostly fish carcasses and began pecking furiously away at it, splattering red droplets of blood onto the shiny white scales as it swirled slowly along the surface of the black waters. Then, another black sparrow landed, ‘cawed’, and leapt after the first one. Then another. Then a dozen. Then a small flock flying in unison, and then another somewhat larger flock descended into the canal with a flurry of black wings and beaks. As he watched with increasing dismay, the cloud of black sparrows grew into a large fluttering mass, a cacophony of wild ‘cawing’ echoing off the canal walls, all around the four dead ghostly fish, pecking at them with a fury he would scarcely have imagined in a nightmare. Within a minute or so the four dead fish were stripped clean of their flesh, and Ishcandar watched the pot-marked white bones descend, swirling slowly into the murky depths, as the birds fluttered off in every direction of the gloom-shrouded autumn sky. None of which was lost on the other members of the party who, having noticed the strange event, had one by one turned from the tower window to view the scene below with mixed reactions of surprise, incredulity and horror. Ishcandar, staring in a dazed and somewhat frightened awe, realized at that moment that what he really needed was another pint of ale. “I don’t think I’ve ever seen a black sparrow before,” said Lido to no one in particular. “Hair of the dog,” murmured Ishcandar, to himself vacuously. At any rate, Hermel, who was the least interested in the fate of ghostly fish, was busy being annoyed at the false starts on their adventure thus far, and took a quick glance at his young friend Jeremy. The boy had a scowl on his face, deeply frustrated that his agreement to bring along the others had resulted in ... this. A low chuckle came to them through the fog. It was emanating from the alleyway behind the Five Crows Tavern across the street from the canal. As it happened the party discovered that it was Bernie, Jeremy’s older ‘brother’ from the Rat’s Den. “You know, that was the funniest thing I’ve seen in a long time,” he said with a twisted smile as he peered out from under his leather hood. Bernie was not a handsome kid, with a long thin nose, greasy black hair, crooked yellow teeth, and a scar on his left cheek, but in this light he had a certain roguish charm. He gave a toothy grin. “So, how long have you been standing there?” asked Lido, rather put out that anyone had actually seen their failed escapade. “Oh I dunno, 15 minutes maybe? I couldn’t help noticing you when this poor slob fell into the brink... Hahaha… for a Hobbit you sure are clumsy,” said Bernie looking at Ishcandar with a wry smile. Ishcandar reached for his dagger in a sudden fit of Hobbit-wrath, but he lost focus quickly and went back into a fog, mumbling something unintelligible. “Well if you saw me fall in, why didn’t you do anything to help?” asked Ishcandar suddenly perking up again, and then just as quickly fading back into la-la land. “Well geeze, kid, what do you expect? Your friends seem to be taking care of it, and there didn’t seem anything much I could do. You think I should have jumped into Dunn’s Brook after you? Hahaha… that wouldn’t be too smart,” answered Bernie with a guffaw. Ishcandar pulled the cloak tightly around himself and stomped his feet to shake some of the water off himself. He was still shivering badly. Dunn’s Brook, he noted vaguely, was awful damn cold. Lido then cut a piece of cloth from his shirt and attempted to tie it around the bleeding wound that the ghostly fish had bitten into Ishcandar’s leg. Unfortunately, the wound was jagged and when Ishcandar winced and gave a cry, Lido realized it was beyond his skill to bind this particular wound. “Well, perhaps you should try then,” said Ishcandar, ignoring any other considerations than stilling the throbbing pain in his leg. “Ok then. Hold still,” said Bernie as he pulled out a small leather bag, and extracted a fine white cotton cloth, and proceeded to expertly clean and bind the wound. It was painful, but once finished, Ishcandar decidedly felt better, and everyone noted what an efficient and expert job Bernie had done. He stood up, put weight on his leg, smiled vaguely, and then began to immediately look for a pub to head to. “Must restore mystic … life … force,” he murmured to himself. “Pint of ale,” he concluded and began to walk steadfastly in the direction of the Five Crows Tavern. Caught by surprise, Lido caught Ishcandar by the shoulders and helped to guide him towards Dunn’s Bridge, which was across the street from the Five Crows. Meanwhile Hermel had decided that the best thing to do would be for him to head back alone to the Tower on Dunn’s Bridge where they’d seen the silhouette in the window, and try to get help for Ishcandar. He thought that they might gain access to the tower that way, and then when opportunity arose, snoop around and try to find the Hagglesmiths, who’d last been seen having been captured in nets by some men down in a secret tunnel that lead out of the basement chamber at the root of the tower. It seemed worth a try, and so Hermel trooped through the fog to the tower door and banged on it loudly. No answer. He banged again. Nothing stirred. He banged again, with even greater effort. But still, there was no answer, and nothing stirred, except the sound of a bell from one of the bridge towers that rang eleven times, the echo ringing up and down the old streets and alleyways. After that Hermel decided that he wasn’t going to have any luck there, and so walked briskly off the bridge toward the party who happen to be marching up the road towards him being half dragged along by Ishcandar who was still trying to steer himself toward the Five Crows. After discussing matters back and forth as to what to do next, and largely ignoring Ishcandar’s dreams of brew, they decided that the first order of business was to warm poor Ishcandar up by a cozy fire somewhere and get him some tea. They’d been talking this over as Hermel walked up. He knew the back streets of the Old Quarter pretty well, and was aware of a tea shop not far that might have Jarrow Root Tea, which he knew from his study of herb-lore might clear Ishcandar head. The poor hobbit was still looking longingly across the street with outstretched arm as Hermel took him by the arm and also picked his Iron Pieces Pouch from his belt and put it in his own pocket, as he commented to Lido that Ishcandar needed some “guidance”, and after all was going to be paying for the Jarrow Root Tea in any case. In fact, Hermel probably saved Ishcandar from spending all his money on his way toward a humongous hangover. So the gang trooped along the slick cobblestone street avoiding the puddles, skirted an alleyway, trotted down a long flight of stone stairs, across a dirt road, slid past an open iron gate, up a street, under two bridges, and came at last to “Lady Gray’s Tea House”. It was warm and cozy looking inside, with a bright fire in the hearth, and a number of tables, some of which were occupied by various sorts of elderly people, a young couple, and some bearded men playing chess. Hermel went in, and wound his way to the old wooden counter where an old crooked lady was measuring teas and putting spoonfuls into pouches. She had bright beady eyes and gave him a look that one might have expected from a hawk so intense was her gaze. Hermel was not in the least bit put off by her stare, but simply asked if she had any Jarrow Root Tea available. She gave him a blink. She cocked her old gray hairs to the side a bit, and then announced that Jarrow Root is very expensive, and wondered out loud if the young lad had nearly enough money for it. He asked how much one cup’s worth would be, and she said it was a startling ten iron pieces. Hermel was not fazed. He asked if he could examine it for it’s quality. She pulled out a small bit of Jarrow from a locked drawer and handed the hairy little bit of root to him. She inspected him while he inspected it carefully with a farm-boy’s knowledge of such things. Correct golden color. Hairs were fine with scarlet tips. Odor was sufficiently pungent, if not exceptionally so. They haggled briefly and she settled on eight Iron Pieces since she happened to like the lad’s forthright manner. And so Hermel paid her, thanked her, and took the root in a little bag outside to where Ishcandar, Lido and Jeremy were waiting. They thought about where they could take it to make a fire and boil the tea, but seeing as how the ground was wet from drizzle, and there was little wood or kindling to be seen, they decided to go back inside and pay the price for a cup of hot water for the tea. The old lady graciously offered them a table, and some biscuits which they downed with the rapid glee of kids who are really hungry, and everyone got a complimentary cup of (regular) tea as well. Old Lady Gray is a bit of a hawk, but she does have a heart deep down inside after all. The Jarrow Root Tea had the desired effect on Ishcandar. Soon he was not only out of his fog, but even more alert than usual. “This is amazingly good tea,” he said after finishing the cup with a smile. He noticed everything around him in vivid detail, even noticing the fly that had buzzed behind Hermel’s head and vanished from view. “Hey, where’s my pouch?” he suddenly wanted to know. “I see you’ve regained your presence of mind,” Hermel replied laughing as he handed Ishcandar his slightly less weighty pouch of Iron Pieces, and everyone had a chuckle over that. All except Jeremy who was sitting glum as a stone looking out the window at the drizzle landing in puddles on the cobblestones. “I’m very sorry about all this,” said Ishcandar to Jeremy quietly. The boy looked up at him and nodded acceptance of his apology. They decided it was time to go. Leaving the tea house they walked down the street where they could speak more freely. As they made there way through the gloom they assessed their options. “I don’t think the bold move would afford us much, at this point,” replied Hermel. “We could search the tavern where we think the tunnel leads to,” he continued. “But they’re on to us as well. Perhaps a diversion would help,” he thought out loud. “How about a rock through their window,” offered Lido. “If only Wuton had responded to my message!” said Ishcandar. They considered the possibility of using Wuton’s name as a kind of threat to the people in the Five Crows, but after further discussion found that there was not much hope in that plan either since they didn't think that very many people may have heard the rumors about Wuton in the Old Quarter. News does not, it seems, flow all that readily to every part of Hobbington. “I’m sure an Iron or two can bend a tongue,” offered Ishcandar. “I’m afraid our options are very few at this point, and perhaps we are already too…” said Hermel, and then bit his tongue as he looked at Jeremy. He was thinking that perhaps they were already too late to save the Hagglesmiths, but he realized perhaps it was best not to complete the thought. “I say we have no time left for caution. We must take action,” said Ishcandar with conviction, as they arrived at the corner of Five Crows Tavern. There were various sorts of people milling around, conducting whatever business they may have had in the Old Quarter, shady or otherwise. A man entered the bar, causing the bell hung above the doorframe to tinkle as he went in. An old man was begging for coins in a doorway next to the tavern. A dog ran into an alley after a cat which screeched as it toppled a pile of old boxes. Across the foggy street Ishcandar noticed a fellow sitting in the shaded doorway of an closed store front lighting a cigarette. He appeared to Ishcandar to have eyes and ears on them. The party approached the figure, who’d been sitting there rolling a cigarette watching them out of the corner of his eye. Ishcandar’s senses had apparently been heightened enough by the Jarrow Root Tea for him to have noticed this, and he felt pleased to realize it. As they approached Bernie turned his head toward them with a slightly mocking smile. “Oh it’s the boy who helped me,” said Ishcandar with genuine surprise. “Much better, thanks to you,” replied Ishcandar. Hermel took the opportunity to scrutinize Bernie carefully, noting that he was an older kid, probably around sixteen or seventeen, and from the slight bulge on the left side of his waste also discerned that he was carrying a concealed dagger stuffed in his belt. “Why are you following us?” he asked pointedly. “Following you? I’m not following you! I just happen to be sitting here rolling a cigarette and if you care to notice, you just walked over to me,” said Bernie with a puff of smoke billowing out of his mouth. “Or at least, why were you listening in on our conversation?” interjected Lido. “Why are you following us?” repeated Hermel dryly. “Goodness gracious, you are bad news, man. To think I tried to actually help you guys out,” said Bernie mockingly. “Do you happen to know where the Hagglesmiths are?” asked Lido pointedly. “What? Hey, wow, you know I only met the Hagglesmiths one time. Jeremy brought them into the Rat’s Den, I said Hi, they said Hi, and that’s it. They went off on their adventure and that’s the last thing I ever saw of them,” said Bernie in a louder voice. Hermel began walking up the flight of stairs that Bernie was sitting on, and Bernie stood up. He was taller than Hermel. “Have you heard of Dr. Lobe?” asked Lido, again pointedly. “Which side are we on?” asked Hermel now standing next to him. “Ok, alright guys, guys, leave him alone,” said Ishcandar now deciding that the guy who had helped heal his leg probably wasn’t a bad guy perhaps after all. “I’m with Jeremy. He’s my friend,” said Bernie pointing to the kid. “He’s a fine gentleman,” said Ishcandar. “He healed my leg. In fact here’s an Iron for being so kind,” concluded Ishcandar as he pulled an Iron piece out of his bag and handed it to Bernie. “Oh, wow, that’s cool, thanks a lot,” replied Bernie looking at the coin with appreciation, taking a bite on it, and put it approvingly in his vest pocket. “See? Now that’s proper hospitality, if you ask me,” he said slapping Ishcandar on the shoulder with a grin. “Well, that’s more like it then. Look there’s a pub across the street. What say you we go over and have a drink together?” said Ishcandar pointing to the Five Crows. “Oh yea, well now that’s more like it. I’m going over here with my friend. We’re getting a pint,” said Bernie blowing smoke in Hermel's face as he walked down the steps of the ancient stoop. “Sure sure, don’t mention it,” replied Bernie as they entered the tavern. The other members of the party followed along behind, and so they found themselves back at the Five Crows Tavern again. As they were crossing the street Lido almost tripped over a rat. It was an unusual rat with black fur, and a white spot over one eye. Lido and Hermel both took their slings out and hurled stones at the creature, but it dodged the stones and scurried into a hole along the edge of the building. Meanwhile, inside the tavern, Ishcandar was apologizing for his friends behavior again, and ordering the best ale in the house. The pepper haired bartender remembered Ishcandar and greeted him in a friendly manner. “Oh hi, it’s my friend! I’m doing well, thank you!” chortled Ishcandar and brought himself up on a stool. Hobbits, if you don’t happen to know, are quite short, and so for Ishcandar, bringing himself up on a stool was a matter of climbing up one side and seating himself with legs dangling over the edge. “Well, I don’t believe I caught your name last time, son,” said the grizzly bartender. “Oh, why sure, of course. My name is Ishcandar, and this is my friend Bernie,” he said with his usual gregariousness. “Well nice to meet you, then. My name is John,” said the man with a grin. “Well, now, really? Why that’s a tall order then. Are you sure? It’s rather a pretty price, I should warn you,” said John jovially. And so Bernie and Ishcandar enjoyed one of the best ales they’d ever had, and were enjoying themselves tremendously. “Golden Emperor Ale! I’ve been around the block a few times, but I’ve never seen this before! You sure have a fine selection, John!” said Ishcandar merrily. At that time Hermel and Lido had made their way cautiously to the bar, looking around carefully to see who all was there as they went. The bar had a number of patrons, most notably at the same table as before were the two men they’d encountered the first time. One was tall and brawny with a vacuous look, while the other was short and thin with a blond beard and moustache whom the two young adventurers studiously avoided making eye contact with. They caught John’s attention at the bar, and the bearish man moved over to serve them. “We would have words with you, sir,” said Lido, trying his best to sound as though he were speaking in some sort of official capacity. “Well, yes… words. Private words, if you get my meaning, sir,” said Lido with a hint of impatience in his voice. “I see. Well, why don’t you boys step into my office then,” replied John, and ushered them to a room beyond the bar. “You look like you’re quite knowledgeable about things that go on in these parts,” said Lido inquisitively after they had settled into the other room. He paced a little bit nervously as he spoke. Hermel stood impassively to the side and stared at John intensely. “You don’t say,” said John. “How about under it?” asked Hermel with a certain edge to his voice. John gave him a sudden serious glare and there was an awkward pause. “Are you trying to cause trouble in here, boy?” asked John gravely. Well, things took a turn south at that point. The boys tried a direct approach, and in their attempt to confront the bartender they gained little information, and only served to get themselves kicked out of the bar. John was a grizzly old salt, and one young man and a boy Hobbit found themselves unable to persuade him to talk about anything he didn’t feel like talking about. And so they found themselves outside the Five Crows Tavern again, with no more information than they had when they entered. “He definitely reacted when we asked him about what is going on under the bar”, said Lido. Hermel then tried to persuade Bernie to join forces with them to find the Hagglesmiths. “Oh. Well, then. I think we can work together after all,” replied Hermel. And so it was that they decided the best thing to do at that point was to head back to the Rat’s Den and get some advice from ol Hagen himself. The Rat’s Den wasn’t all that far, and they wound their way through the Old Quarter to get there by about noon or so. There above the tunnel leading down the long flight of stairs to the Rat’s Den was a red sign with black lettering. It read “The Rat’s Den Pub”, though none of the boys could actually read it since none of them had been educated for reading or writing. The closest was Lido, who at least had gotten training on rudimentary map making. The Adventurer’s Guild is a practical organization, training members for what is most needed, and not necessarily for what is most illuminating, and so members wind up with sets of pragmatic skills, if not comprehensive, generally speaking. A formal education in Hobbington is a rare and precious thing, as it happens. Down the flight they went, and it was a long way down indeed. Finally at the bottom Bernie knocked three times at the solid wooden door with the iron bands and bolts, and a slat opened. “Password?” came a gravelly voice from the other side. “It’s me,” said Bernie, and the door unbolted and opened into the main area of the bar, dimly lit with lamps, and a fire in a corner. At the far end of the bar was a long blackwood counter with a bartender cleaning glasses, while fluttering around through the customers with a tray of beers and food was a young waitress delivering fare and taking money. “Oh out and about. No troubles, so don’t worry yourself to death,’ replied Bernie coolly. “It’ll be a cold day in hell before I worry myself to death over the likes of you,” said Hagen with a grim smile, which Bernie returned in kind. “And whose these you got with you, then?” he asked nodding toward the new comers. Everyone was introduced, and the situation was laid out on the table nice and plain. Hagen listened intently to everything the new comers had to say. He scratched his head, tugged his beard, and thrummed his fingers on the worn black wood of the bar. Finally, he decided to help them out after all, partially because poor Jeremy had the worst lost-puppy look ever in the whole wide world (of Hagen’s bar, anyway), but mostly because of their determination to help rescue the Hagglesmiths after Hagen warned them that the folks who captured them, in all likelihood were rough men, and not going to be easily fooled, or overcome. “Well, I’m determined to go and rescue them, whether it’s dangerous or not,” had replied Lido bravely, and that had turned the tide with Hagen. And so, to show that he was a stand up guy he opened his storeroom to the young adventurers and let them take their pick of ropes, torches, iron spikes, and the like, and they bundled the items up into knapsacks with great cheer and enthusiasm. He even tossed in, at their request, a couple of special items, such as a barrel of sticky oil. He also advised them that they ought not to delay, but get about the business of rescuing the Hagglesmiths right away, and not wait until the next morning as they had been discussing amongst themselves. Otherwise, he warned, who knows what might become of those poor kids. Hagen then set about helping them to shore up their plan. As it turned out Bernie was familiar with the sewer system near Dunn’s Bridge, and said that he knew of a tunnel in which he had once found a secret passage that lead into the chambers beneath Dunn’s Brook. They decided at once to head there and invade the premises via the secret passage in the hopes that they might locate the Hagglesmiths. Off to Dunn’s Bridge they went, taking side alleys, old footpaths, and hidden passageways between the tall old brick buildings. Eventually they came to the head of an alley that overlooked the spot where Ishcandar was pulled out of the Dunn’s Brook which is where they first encountered Bernie. As it happened, right at that spot was a drain cover made of wrought iron. They looked left, they looked right. No one was to be seen, and so he used a crowbar and hefted the cover to the side. They then climbed down a long ladder into a dark tunnel that paralleled the canal. The tunnel was not very wide, but it was very long, and dark, and there was a stream of water tricking down the center of the floor. It smelled awful. Hermel and Jeremy lit torches and by the flickering light they marched roughly twenty feet along the tunnel until they came to a section of wall between two posts that formed an archway. Just beyond that spot Bernie stopped. He felt along the wall, fiddled with something, and suddenly there was a loud click. A door slid ajar slightly. Bernie used his crowbar to open it enough to get his fingers through, and then with a little huff he slid the door aside. Inside was darkness. Everyone waited and listened intently. No sounds. Bernie then pulled out a pocket from his vest and up popped a furry little head. It was a rat. A rat with black fur, and a white spot around it’s right eye. The rat climbed up onto Bernie’s arm, and Bernie whispered something to him. And then jumped down and vanished into the dark opening before them. “Yup. He’s my pal,” said Bernie proudly. “Best thing about him is that he can smell out the Hagglesmiths. He met them, too, when they came down into the Rat’s Den. So he has their scent,” he explained. “Really,” said Hermel, remembering the rat from earlier and now being somewhat relieved that neither he nor Lido actually managed to kill the thing. After a short time it came back, and Bernie took him up into his vest pocket again. “Nothing there,” he said. And so they took a torch and pushed it into the opening. Inside they saw a large square room, with furnishings. Very fancy furnishings. And a fine woven carpet on the floor. A beautiful inlaid desk, a cabinet with a glass door and bottles inside. And two floor to ceiling bookshelves, filled with books. The walls were made of stone, but covered over by tapestries of animals dancing through forests. Protruding from the walls were several glass lamps with bronze bases. There were two doors in the room. One was a beautiful double wooden door, with a fine bronze handles and a skeleton key lock. The other was a huge solid iron door with a heavy iron bolt with two handles. Overall the room was very elegant, and seemed to be a study. But everyone stared at the iron door. “Or rather… what is that door keeping at bay?’ said Hermel rhetorically. They entered the room and began to search it. They tried the wooden doors but they were locked. 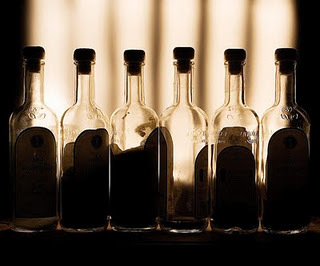 They looked in the cabinet and found that the bottles, to Ishcandar’s delight, were filled with various fine liquors. Ishcandar tried searching the desk, and found that one of the drawers was locked. He attempted to open it with his lock picking tools, but the lock proved a little too tricky for him. So, not wishing to waste much time on niceties, he took out his small crowbar and broke the lock, prying the drawer open. Inside was an envelope which was sealed with an insignia in red wax. He broke the seal and found inside what appeared to be a letter in fine calligraphy. Ishcandar however was not yet trained to read, even though he was a wealthy boy from the High Ridge area of Hobbington. So he took the letter and shoved it into his shirt. Meanwhile Hermel was forming a plan of action. He took several bottles of brandy from the cabinet and had Bernie move the desk in front of the wooden double doors. He balanced the brandy bottles on the edge of the desk so that should anyone force their way in, the brandy would fall. Around the desk he emptied another bottle of brandy onto the carpet explaining that they might need to ignite a quick fire in the room in case of emergency. Ishcandar was aghast at the horrid waste of excellent liquor, and took a big nip from one of the remaining brandy bottles, least that too might go to waste somehow. While he was doing this, Lido was checking the brass lanterns. He turned a small knob, and as he somewhat expected, a hissing noise came from the top of a small metal wick. He shut the valve, commenting that the lanterns were piped with gas, but they decided to leave the lamps off just the same. They had seen piped gas lanterns in some establishments around Hobbington before, but they were rare. No one knew how they were created, though, as the town itself was much older than it's present occupants. In any case, they felt it was safer to leave them alone for the time being. “What now?” asked Bernie looking around with a bit of consternation. He did not appear to approve of the rifling and vandalism, though one might have supposed that strange, given Bernie's attitude about things generally. “We try the metal door,” said Hermel, and without much ado, they slid the bolt open. It was a remarkably well crafted door and the bolt slid along the metal slot. When they pulled the door, it moved very easily, despite its enormous weight, without any sound at all, except for a slight hiss when the door’s rubber seal was opened. Ishcandar noticed a slight aroma of chemicals wafted into the room. “Bernie, you stay here and guard the rear. If anyone comes shout down and we’ll come up,” said Hermel, as the others stared into the darkness ahead. Hermel brought a torch up and they saw a flight of stairs going down. “I wonder, really wonder, why this door is so… solid. What are they keeping in down there?” asked Lido. But no one answered. They took a step onto the stairs. The corridor down was made of smooth gray stone, and the steps were made of single slabs of the same. The air was cold. And they noticed a strange chemical odor. “Jeremy, you stay here and make sure that the door doesn’t close on us. If anything happens, shout,” said Hermel. And they then proceeded to slowly creep down the stairs toward a landing at the bottom of which was another metal door exactly like the one upstairs, and bolted shut in the same fashion. “Two strong iron doors?” asked Lido, more to himself than anyone else. There was no answer. They slid the bolt, and opened the door. There was a strong chemical smell as the door hissed open. Again they faced darkness. Hermel pushed his torch into the opening, and they saw a large square room filled with shelves on which were many glass jars filled with different colored liquids. There was a table in the center of the room with a cloth draped over a large lump. They slowly entered the room, and went to the table. Hermel pulled the cloth away, and beneath they found the body of a boy. His face was bloated, and there were circular blue welts on his arms and chest. They quickly looked away and covered him again. Lido and Ishcandar went to examine the shelves. They found that some of the jars had strange blobs in them. Several had clumps of hair, or teeth, or a tentacle, or all three. But none of them resembled anything like an animal. They were only lumps of flesh, with … features. On the far side of the room was a wooden door. They went to it and found that it was unlocked. Opening it they peered again into darkness. This time they found a corridor going to the right and the left into darkness. On the ceiling Ishcandar noticed that there was a circular grate, like a drain pipe, made of metal. “A drain pipe on the ceiling? That’s odd, … isn’t it?” he asked, but no one answered. They decided to go right and see what else was there in the hopes that they would come upon the Hagglesmiths soon. Creeping quietly down the hall they came upon a heavy wooden door with iron bands, and a lock. Ishcandar took his lock picking kit out, and after a few moments they heard a click. The door swung open, and on the other side they found a cave. The floor was rough and had pools of water, and the walls were covered with gray lichen and patches of slimy moss. There was the sound of burbling water echoing from an open corridor that led out of the cave on the other side of the rough hewn room. They walked in, thinking to explore further, when Hermel stopped. On the ground was a green toad with yellow spots and red eyes, about the size of a man’s fist sitting on a dry patch of ground. Suddenly it leaped up and smacked Hermel on his right arm with a slimy splat, dropped to the ground, and began hopping away. Ishcandar quickly flung his knife at it, and pinned the thing to the ground so that it croaked and died. Hermel began to feel woosy, and a circular blue welt began to form on his arm. He suddenly felt a chill, and shivered and his arm grew numb. Ishcandar noted that Hermel began to break out in a sweat, and everyone became quite concerned, darting eyes all over the chamber looking for any other toads. “I think we had better go back,” said Hermel swatting at a fly with his good arm. Behind them, in the darkness, Ishcandar could hear the sounds of croaking toads as the Adventurers retreated from the cave chamber. And so they began to make their way back the way they came, having discovered quite a few mysteries, but not a hint regarding the whereabouts of the Hagglesmiths.